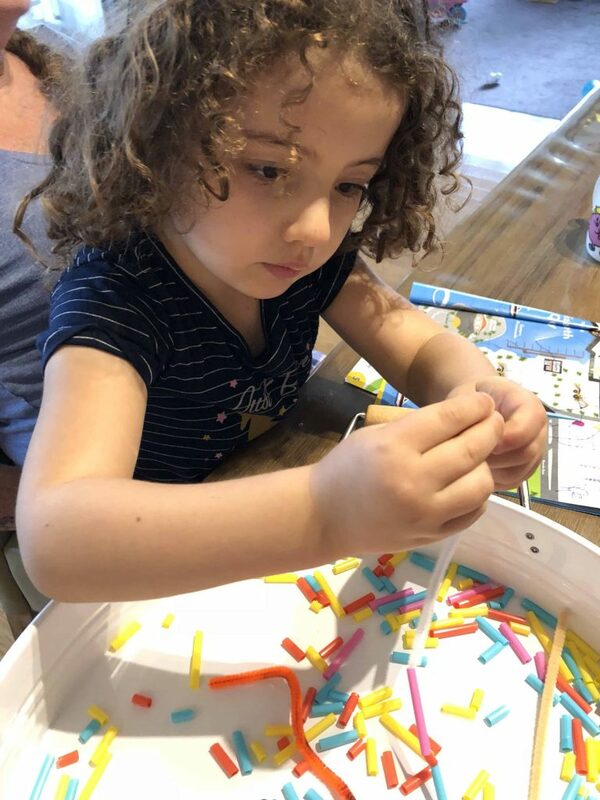 Home / Fine Motor Activity / Poking Pom Poms! 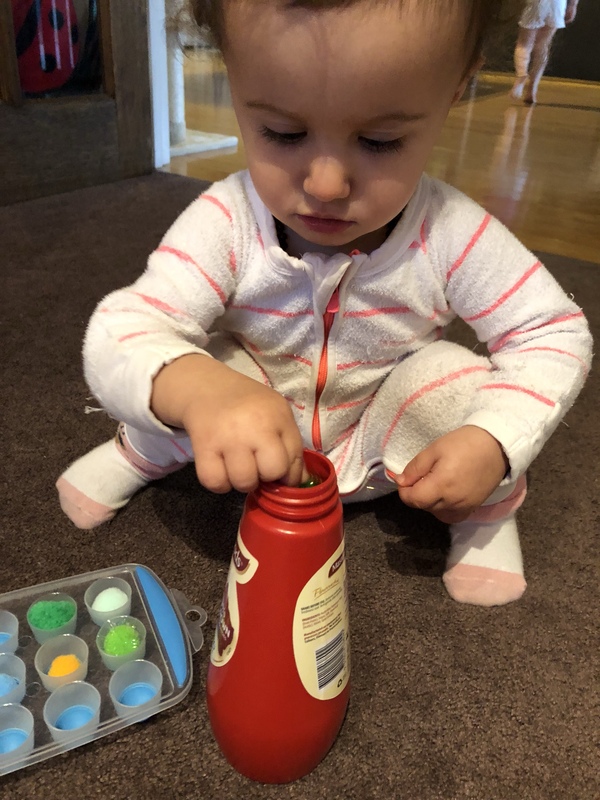 Miss 15m loves screwing and unscrewing the lids from bottles, containers and little pots. Watching her manipulate her fingers in different positions and strategising how to remove the lid is so rewarding. She is learning to persist through trial and error- a skill that will continue to develop well into adult hood! This morning I thought I would add an additional element to her play. 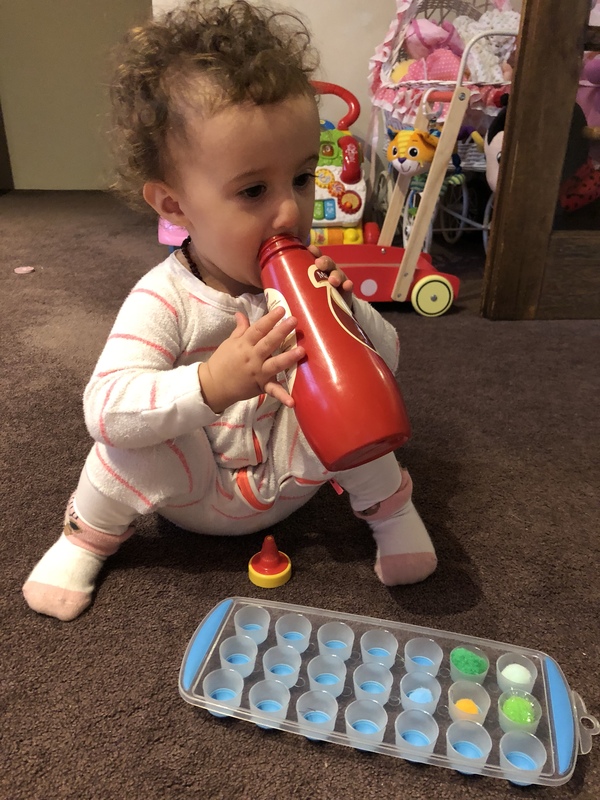 Miss 15m’s bottle of choice was an old sauce squeezey bottle. After spending time twisting and turning the lid, I placed a tray of pom poms in front of her. The bright colours caught her attention instantly. Quickly her fingers were exploring the different textures pom pom. Using her pincer grip, she retrieved her selected specimen and was pulling at the strands of glitter. I too, picked up a pom pom then dropped it into the opening of her bottle. Monkey see, monkey do. 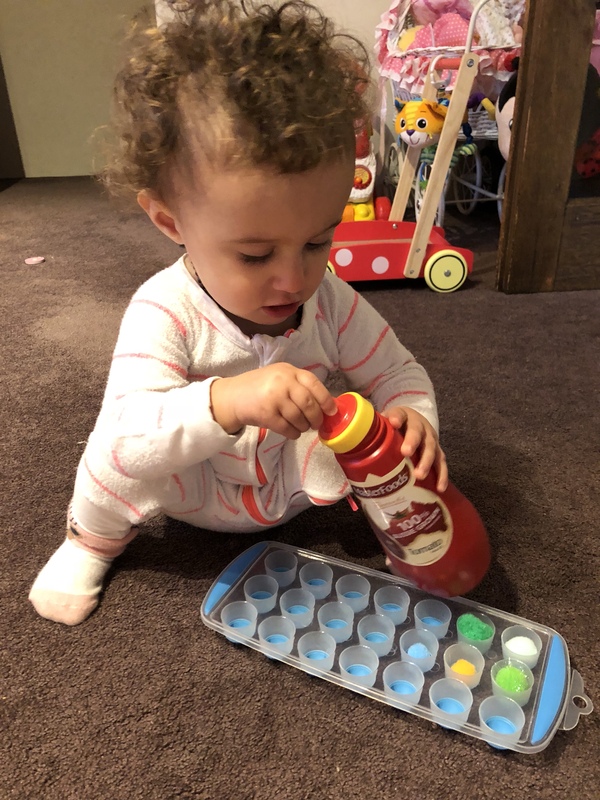 Miss 15m face smiles as she focused on picking up each of the pom poms, carefully lined them up with the opening of the bottle and then dropping them within. 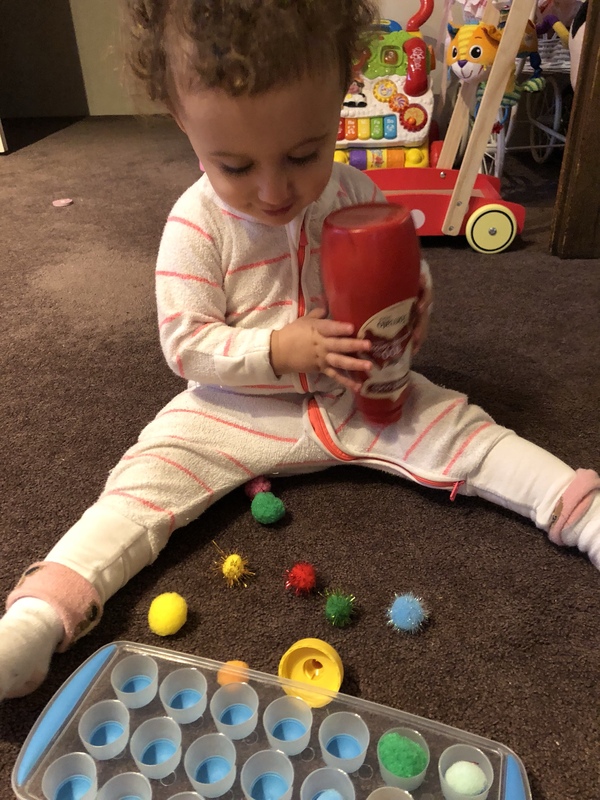 After giving her the brief, she enjoyed piling the pom poms into her bottle. Then she started to free lance and create her own play. She was shaking the bottle, tipping them out, laughing as they fell to the the ground and the sound that echoed in the bottle as she spoke into the top. This activity lasted about 20 minutes and while it looks very simple we were building a good foundation of skills for more complex tasks that will come in the future. We are going to collect some gum nuts for next time. I think the added rattle would be an element to build onto this experience. 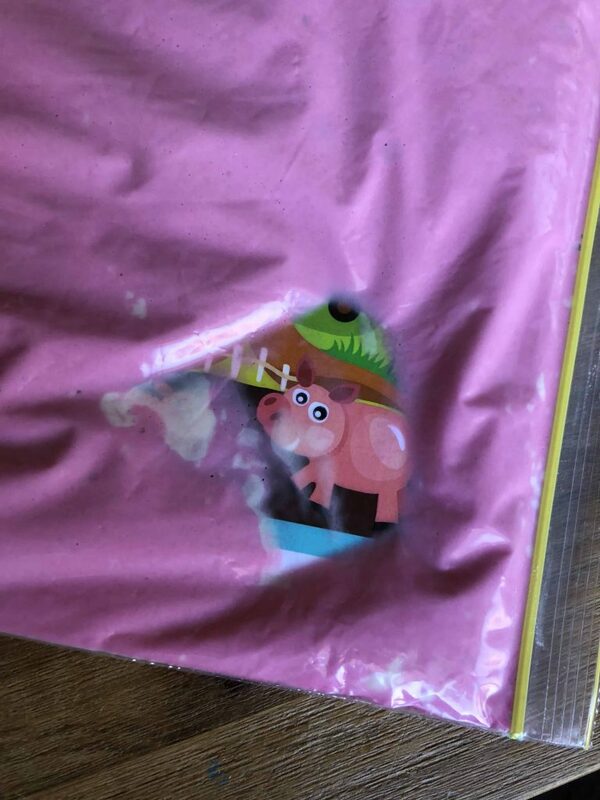 What are some materials that you have at home that you could use to re-create this activity? Next ArticleHomemade Yogurt- less sugar and more savings!